Natalie Merchant made a very poetic return to performing on stage after a seven-year hiatus–literally. Her latest work, Leave Your Sleep, takes poetry written by others (such as Edward Lear, Gerard Manley Hopkins and e.e. cummings) and reinterprets them as songs with Merchant composing the music. Half of the set performed at Town Hall on Friday, the second of a two-night stand, were devoted to a selection of songs from Leave Your Sleep. Accompanied by a large ensemble of musicians that included woodwind players, a banjo player and a fiddler, Merchant introduced each selection by describing the poem and the poet before launching into the song (There was an image of the poet projected on the screen). But the mood gradually picked up considerably through stylstically-diverse tunes: Arthur Macy’s “The Peppery Man” mirrored that of a Tom Waits tune with its smoky blues stylings; Nathalia Crane’s “The Janitor’s Boy” modeled itself after a 1920’s jazzy number. “Bleezer’s Ice Cream,” written by Jack Prelusky, was a whimsical highlight recalling the ‘60s Brill Building sound. The mostly boomer-crowd–40 somethings and older–were treated to some excellent and exquisite musicianship from the singer’s large band, who juxtaposed both elegiac and jubilant sounds. As for Merchant, the time off in which she devoted to her recent project haven’t diminished her distinctive singing. 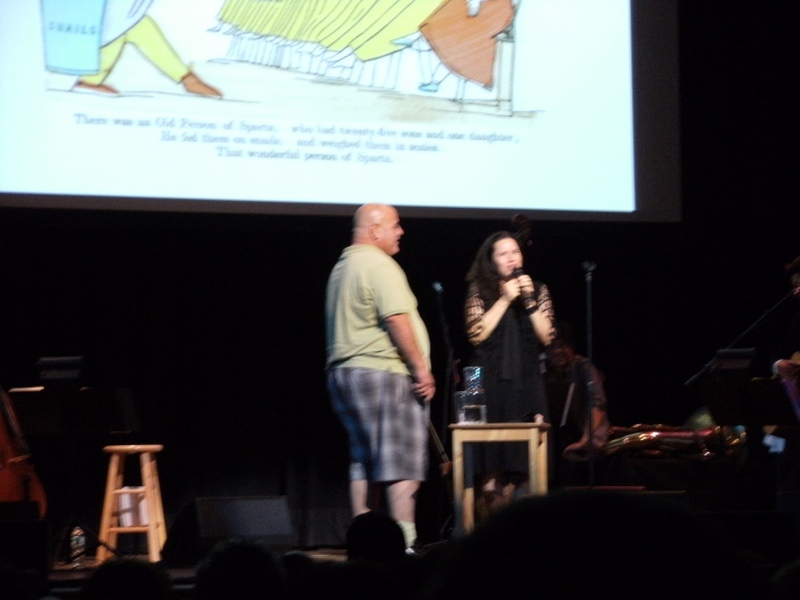 She chatted with the audience with a sense of humor and alternated between dancing and playing percussion. The highlight of the evening was a non-musical one. Before performing Edward Lear’s “Calico Pie,” Merchant asked for someone with an English accent to read some lines of Lear’s poetry onstage. Instead she picked a guy with a Brooklyn accent who volunteered to do the deed. The lucky fellow, named George from Williamsburg, got up on stage and took on the work of Lear. It was interesting to see a tall large stocky guy in shorts standing next to Merchant sharing some lighthearted banter. The verdict on Merchant’s second Town Hall appearance from the weekend: elegant and musically-rich.